LITTLE ROCK, AR – The U.S. Green Building Council (USGBC) recently announced the Leadership in Energy and Environmental Design (LEED) certification of the Ritter Communications building in Jonesboro, Arkansas. 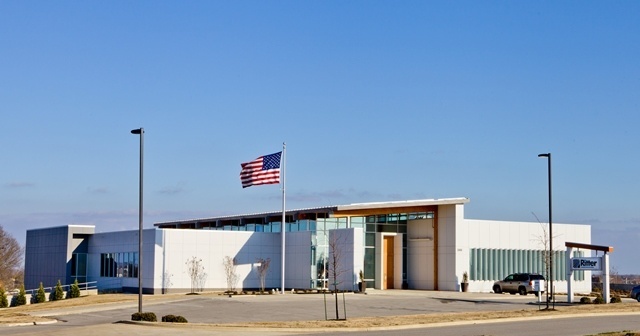 With the assistance of Viridian, the building was awarded a Silver level of certification, becoming the first newly constructed facility, and the second in Jonesboro to achieve certification. Located at 2400 Ritter Drive, the new facility was designed to serve as headquarters for the regional telecommunications provider and to consolidate multiple office buildings throughout the community. The impressive 32,645 square foot, two story office building includes office space, large conference and meetings rooms, and houses over 100 employees in an open air working environment. To limit the impact of the facility on air pollution, acid rain, smog and global climate change, over 55% of annual electricity usage for the first two years of building occupancy is offset by utilizing green power that is produced from renewable sources. To incentivize alternative forms of transportation, low-emitting and fuel efficient vehicle preferred parking spaces, as well as, bicycle parking, bicycle lanes extending into the community, and accessible showers and changing rooms are provided for employees. To provide a healthier more comfortable work environment, a plan was developed to maintain Indoor Air Quality, which included prohibiting smoking from within 25 feet of entries, outdoor air intakes and operable windows. The site was made more sustainable by ensuring that over 55% was restored with native or adaptive vegetation and almost 42% was dedicated as vegetated open space. Of the materials used in construction: over 16% contained recycled content and over 27% were both extracted and manufactured from within 500 miles of the project site. Using the LEED for New Construction rating system, design and construction of the Ritter Communications building laid the foundation for sustainable operations and maintenance practices for the life of the facility. Upfront planning for green operations and maintenance will ensure that the building performs to its full potential. The Ritter Communications building was designed by Brackett-Krennerich Architects and constructed by Baldwin & Shell Construction Company. Viridian provided LEED Consulting, Energy Modeling, and Fundamental Commissioning services on the project. Ritter Communications, founded in Marked Tree, Arkansas and headquartered in Jonesboro, began providing local phone service in 1906. Today, Ritter serves 62 communities and more than 45,000 customers in northeast and north central Arkansas, southeast Missouri and west Tennessee with advanced voice and data services, TV and high speed Internet typically found only in major metropolitan areas. Ritter invests heavily in the communities it serves by deploying proven, best in class infrastructure and technology while coupling it with a world class customer focused experience. To stay connected, visit rittercommunications.com or facebook.com/rittercommunications.